Strengthening Union Pacific’s diversity programs is a key focus and an ongoing process essential to growth and prosperity. Our most innovative solutions will be developed by teams of people who view challenges through different lenses and come together to create game-changing technologies paving the way to Union Pacific’s next 155 years. Employee Resource Groups (ERGs) offer nurturing networks and promote a diverse workplace where everyone does their best work. Executive sponsors foster ERG growth opportunities and address member concerns. Training opportunities help managers and employees develop cultural competencies. Our Valuing Diversity and Inclusion initiatives are designed to develop a greater sensitivity to and an appreciation for cultural differences. They strengthen behaviors demonstrating respect and inclusion of employees from all cultures. Executives host quarterly lunch meetings providing intimate networking opportunities for ERG members in groups of four. Groups discuss professional growth, development and work/life integration. Employees share information and build relationships in a positive manner. Union Pacific’s Diversity and Equal Opportunity teams review every department’s diversity and inclusion initiatives. The collaborative effort fosters a nurturing environment supporting employees with professional development, mentoring and departmental-specific opportunities. Railroads face a growing shortfall of skilled trade workers due to a decreasing number of people choosing to learn a trade. The rail industry workforce is predominantly male, and we proactively recruit and encourage women to see themselves succeeding at Union Pacific. Digital and social media outreach highlights women working in the Transportation, Engineering, Mechanical and Technical departments. We also provide mentoring opportunities, child care and other supportive resources to support women at Union Pacific. In 2017, Union Pacific hired 10 percent more women into our Operating Management Trainee program than in 2016, rising from 16.67 to 27.03 percent. We continue developing recruiting strategies to attract talented people from underrepresented backgrounds in our company. Employee Resource Groups (ERGs) offer nurturing networks and promote a diverse workplace where everyone does their best work. Executive sponsors foster ERG growth opportunities and address member concerns. Nearly 3,000 employees are involved in one or more of the following ERGs. While most ERGs traditionally hosted annual member conferences, Union Pacific’s eight ERGs participated in Union Pacific’s first all-ERG conference in 2016 in Omaha, NE, home to our corporate headquarters. Our ERGs will share best practices and development opportunities tailored to their specific needs at our 2018 all-ERG conference in Omaha on October 30. 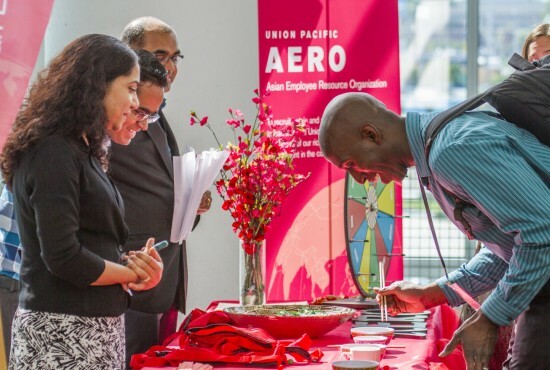 ERGs provide business updates and offer sessions with department leaders educating members about various company roles and potential opportunities. Members also help departments solve business challenges, providing professional growth opportunities.